I love pies of all sorts. I love pies so much that I bought Hannah Kaminsky’s Easy As Vegan Pie: One-of-a-Kind Sweet and Savory Slices . An entire cookbook devoted to savory and sweet pies! My mouth began watering just looking at the pictures. I decided to try the Taco Pie. There’s no pie without a pie crust. This recipe calls for a simple 5 ingredient cornmeal crust. 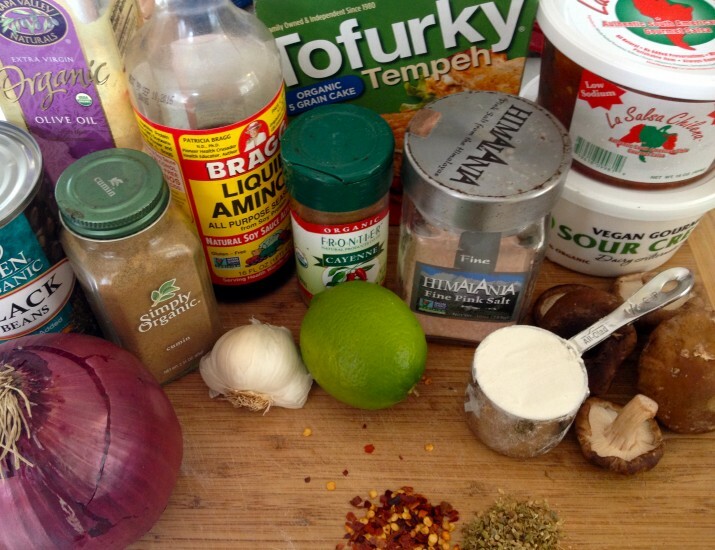 Place all of the ingredients in a food processor. Pulse until combined. Do not over mix. If you do not have a food processor, use a pastry cutter or forks to break up the vegan butter. Next, roll out cornmeal dough with rolling pin. Try to maintain the round shape of the dough as much as possible. If you don’t have a rolling pin, you can use your fingers to press the crust into the pie pan. I recommend tasting this crust. It’s not too sweet and has a light corn taste. Delicious! Then it’s time to gather the filling ingredients. First, cut up the tempeh into small pieces. Throw the pieces into a saucepan and cover with water and boil. It’s then time to saute the onions, garlic, and mushrooms. Place the taco filling in the cornmeal crust and spread until smooth. While the pie is in the oven, it’s time to prepare the Sour Cream Filling. Take the pie out of the oven and top the pie with a layer of sour cream. After the pie makes another short visit to the oven, the pie is ready! Then it’s time to garnish the pie! Shredded lettuce, diced bell peppers, guacamole, or vegan cheese would all be appropriate toppings! Have fun! This pie was everything I hoped it would be. Substantial, flavorful, and fun to make! Plus, I’m pretty sure this pie will provide leftovers for the better part of a week! Place flour, cornmeal, salt, sugar, and water in food processor. If the dough holds together when you pinch it, you're done! if the dough crumbles when you pinch it, add additional water, a teaspoon at a time. Place cornmeal crust in the refrigerator. Chop the tempeh into small squares and place in saucepan. Cover tempeh with water and bring to a boil and then allow to simmer for 15 minutes. Heat olive oil in saucepan and saute onion for 5 minutes. Add the garlic and mushrooms to the saucepan and continue to cook. When the veggies begin to stick to the pan, add the vegetable broth and salsa. Drain the tempeh and combine with the veggies, vegetable broth, and salsa. Then add the black beans, liquid aminos, and all of the spices. Allow mixture to simmer for 15 minutes and add salt to taste. Let mixture cool for 15 minutes. Mix flour in slowly to avoid clumping. Take cornmeal crust from the refrigerator and place taco filling in the crust. Smooth filling with a spoon. Take the taco pie out of the oven and top with sour cream filling. Place pie back in oven for another 10 minutes. 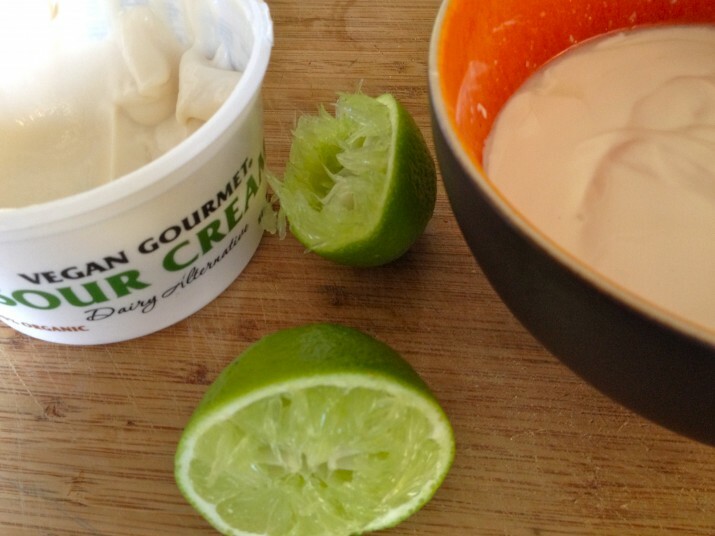 Mix the vegan sour cream and lime juice together. Allow pie to cool at least 15 minutes before adding any toppings.